My husband and I have to move, and we’ve been going through our stuff, hauling things we don’t use any more to Value Village and the like, boxing other things, et cetera. It’s a long, boring, tiring process. It is also sometimes grueling emotionally. I’ve always been someone who cries easily—tear jerker moments in books, movies, or TV shows always get me, for instance. There’s an old idiom I don’t hear very much that captures it well: “I cry at card tricks.” There are a lot of moments while packing things when I find myself a bit surprised at the emotions things evokes. One reason is because we just have a lot of stuff so that every book case in the house as shelves where there is a second row of books behind the books you can see. And it isn’t just books that have been put away like that. So I keep finding things that I haven’t looked it in a long time and were hung onto for sentimental reasons. Not everything that has hit me like a stab in the heart has been stuff that was hidden away. It was mid-November when he died, and everything in my memory for the next gets a bit jumbled from that moment when they turned off the breathing machine through the next few months. There are some moments that stand out for different reasons. One day probably right around the beginning of February, not quite 3 months after Ray died, I walked into the grocery store that’s a few blocks from our place. I had grabbed a hand basket rather than a cart, because I was only planning to pick up a few things. Just inside the door they used to have this sort of miniature gift shop? It had a small variety of greeting cards for many occasions, some gift bags, and a few tiny toys, trinkets, and/or small plushies. The sort of thing you could grab as a last minute present because you didn’t have time to go elsewhere. I was walking past this thing when something out of the corner of my eye caught my attention. 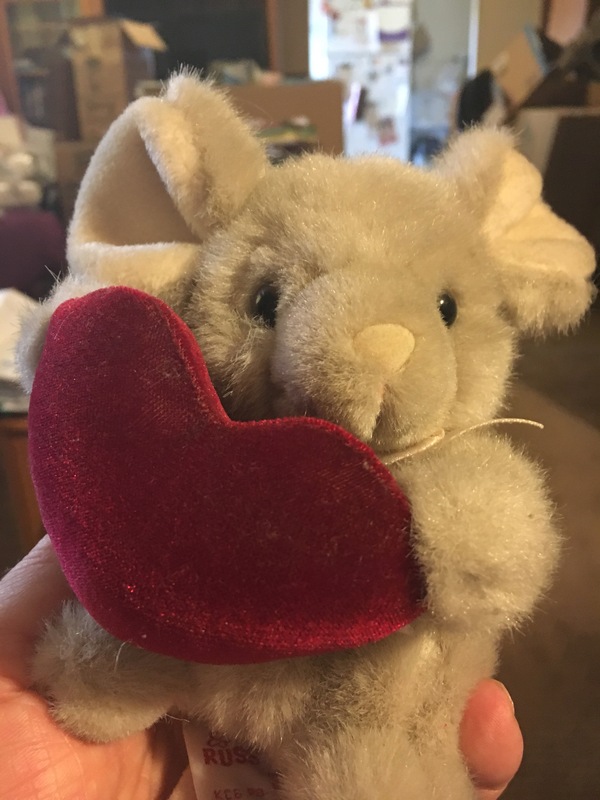 I stopped, glanced over, and there was this cute little stuffed brown mouse holding a red heart. I picked it up, a warm feeling washing over me with the thought, “This would be perfect as a little surprise Valentine’s present for Ray!” The sort of thing I would attach to the outside of a gift-wrapped box with something bigger in it. Before the thought had completely articulated itself in my head, I crashed right into the recollection that Ray was dead and I wouldn’t be sharing any of our usual Valentine’s Day activities with him. It wasn’t the first time that I had that particular momentary internal dissonance. Those moments were among the worst: for a second I would forget that he was dead, and have a normal thought about something I would tell him when I got home for instance, then the realization, which was a shattering moment reliving that first wave of grief when the doctors convinced me that Ray was brain dead and I needed to let him go. It really felt as if I had lost him again. And then, a moment after that, an equally devastating stab of guilt—how could I possibly forget that he was dead? I put the mouse in my basket, because damn it, I was buying it for Ray, anyway! Ray’s ashes are in an urn that has been resting on a shelf in one of the bookcases in my current living room for 19 years, 4 months, and 2 weeks. 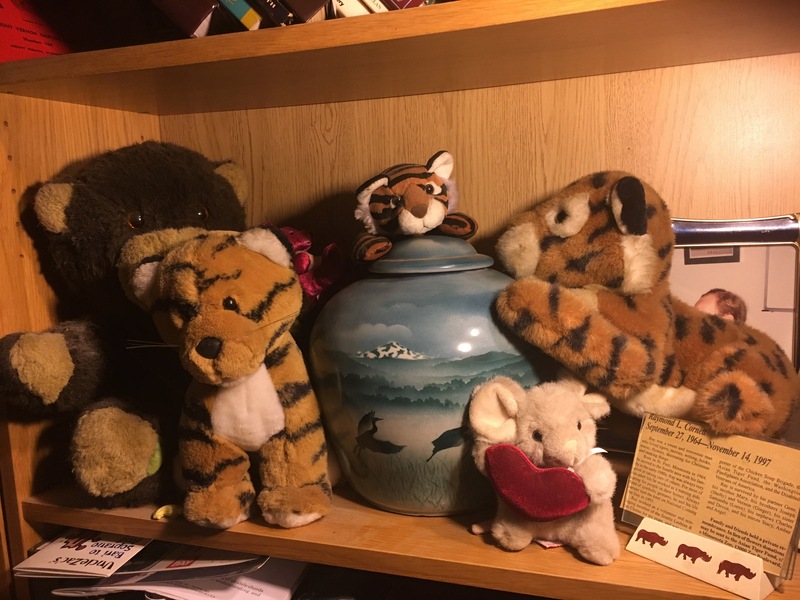 The urn is attended/guarded by three of his tigers, two of his teddy bears, and the little mouse that had me sobbing in the store three months after his death. This is just one of the reasons I don’t want to move. This was the last place Ray lived. Of the three homes we shared, this was the first that he really loved (because when we first got together we were both coming out of messy break-ups that left us both in bad financial shape, so we first lived in a really crappy studio, and I was still digging myself out of the previous relationship’s debts a few years later, so we moved to a slightly less crappy 1 bedroom, before finding this place). Ray loved having a yard, even though it was very small, and being in a neighborhood that felt much more like a small town than part of a city.